Alert hikers might first notice California hoptree (Ptelea crenulata) because of its sweet fragrance drifting across the trail. 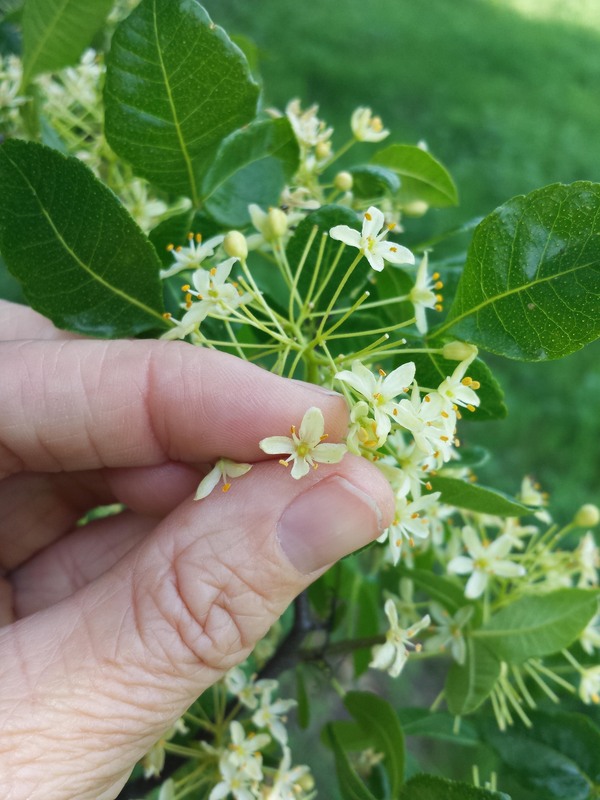 Both the leaves and the blossoms exude a sweet scent. This makes it a good garden plant not just for its own sake, but also because ants and other insects love the flowers, and in turn attract jays, flycatchers and other birds. 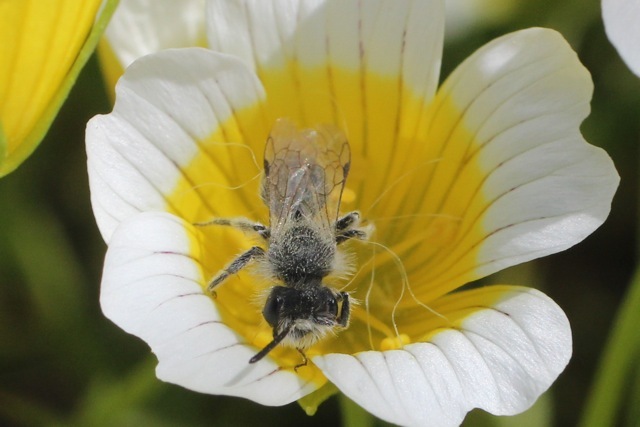 Each blossom is very pretty, with 4 or 5 narrow white petals, and stamens tipped with bright yellow pollen. Look for ants happily roaming across the sprays of small white flowers. This California endemic grows in canyons and woodlands; the distribution loosely circles the Central Valley (as you can see on this map). California hoptree have distinctive deep green, shiny leaves divided into three leaflets. 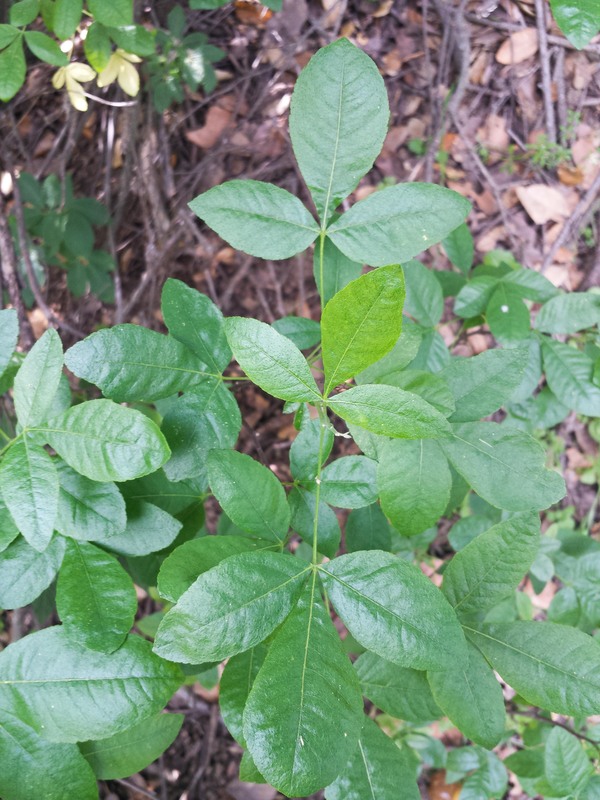 But be careful–it can easily be mistaken for another three-leafleted native: poison oak!! Both also have small white flowers, so be sure to be cautious. 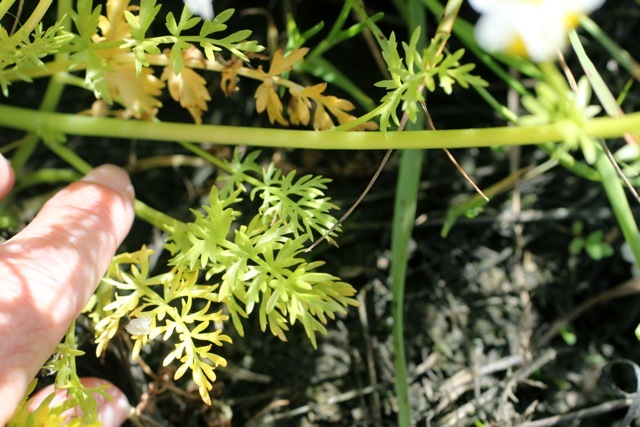 This inconspicuous, trailing plant is one of the most prized herbs of the west coast. It has a strongly sweet, slightly minty flavor that made it valuable for both cooking and medicine. The city of San Francisco was named Yerba Buena until 1847; in Spanish, the phrase literally means “good herb”. Yerba buena (Clinopodium douglasii) is a dainty little plant. 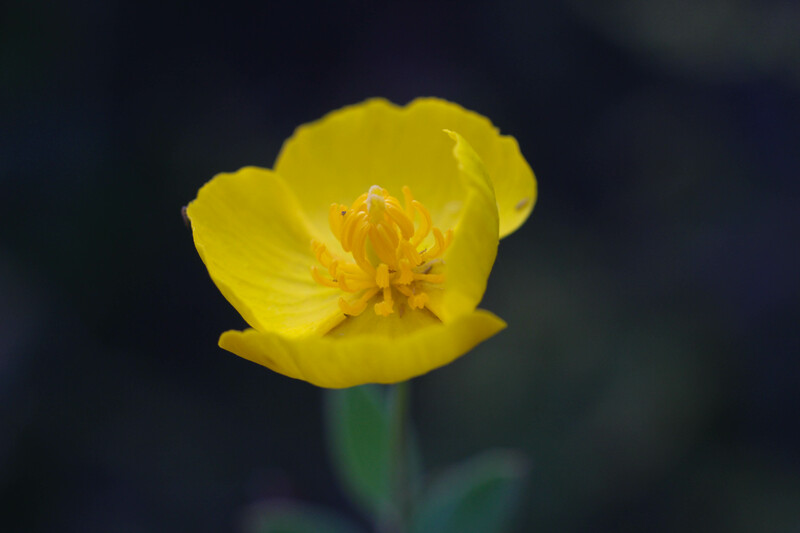 It is widespread in the area, growing in the coastal scrub and deep under the redwoods. You can find it from Alaska to Los Angeles county. The paired leaves are a light spring green but often are tough and slightly sandpapery to the touch–though in sheltered, shaded places they can be quite delicate. 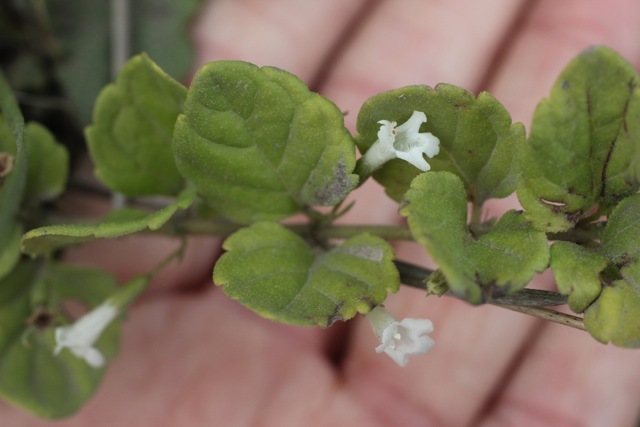 In the spring, tiny white flowers appear along the stem, at the base of the leaves. It spreads from woody rhizome, but the prostrate stems also can grow roots, which is why you’ll often see it growing as a sparse, leggy mat. The plant was used to season food, as a tea, and as a perfume; hunters would rub the leaves on their skin to disguise their odor from game. Yerba buena was taken medicinally to treat colds, fevers, pinworms, insomnia, kidney problems, toothaches, colic, upset stomach, thinness, and to become thin. It was also used as an aphrodisiac. 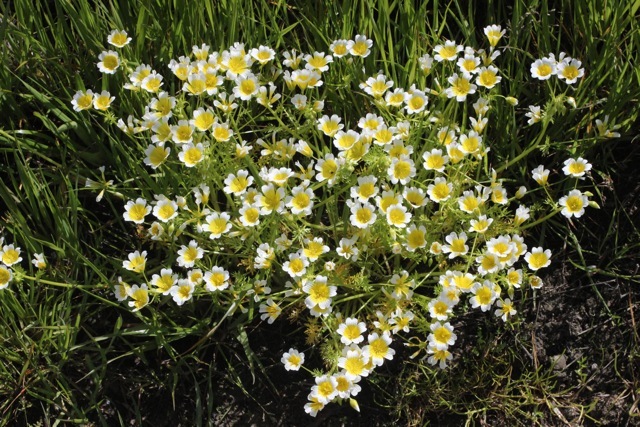 Broad-faced, freckled little flowers are scattered across the grassland. These are baby blue eyes (Nemophila menziesii), a sweet sight of spring. Each showy blossom can be up to 4 cm across, and when they grow en masse they are even more striking. 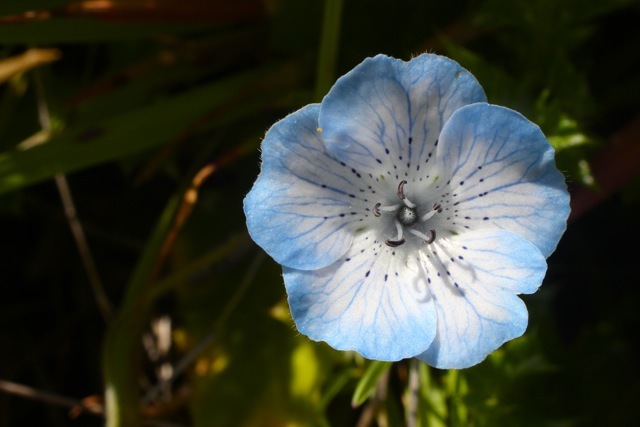 In Marin, these flowers usually are a pale blue, but they can also be white–or a dark blue that fades toward white at the center. Baby blue eyes are in the waterleaf family, along with Phacelia and yerba santa, but unlike both those species it has only one showy flower per stalk. They can grow scattered or in dense clusters, with the long-stalked blooms rising above pinnately compound leaves. 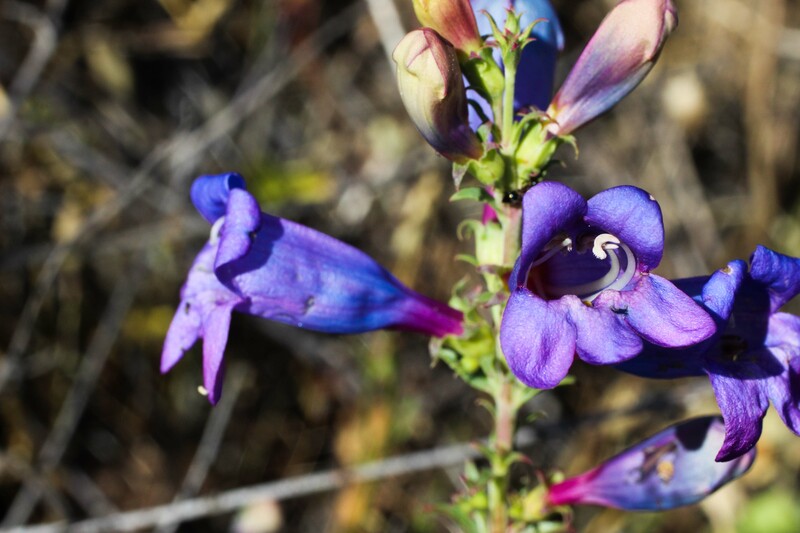 Look for this bloom from southern Oregon to northern California. Gardeners love this little annual because it can self-sow, seeding a new batch each year. A mat of green, heart-shaped leaves march along the side of a steep hillside, punctuated here and there with bright yellow blossoms that seem to glow in the shade of the forest. These are redwood violets (Viola sempervirens). 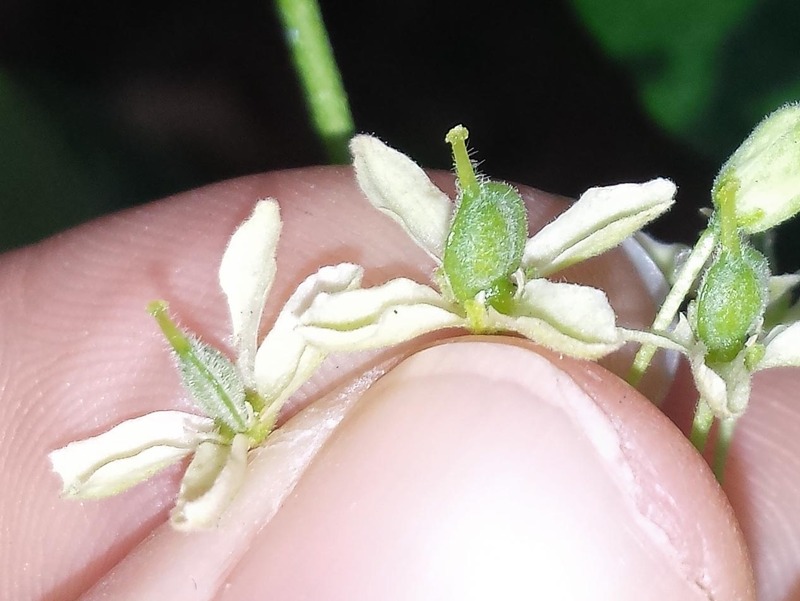 These little flower grow from a creeping stem that sends out rooting stolons, which then grow a new rosette of leaves. 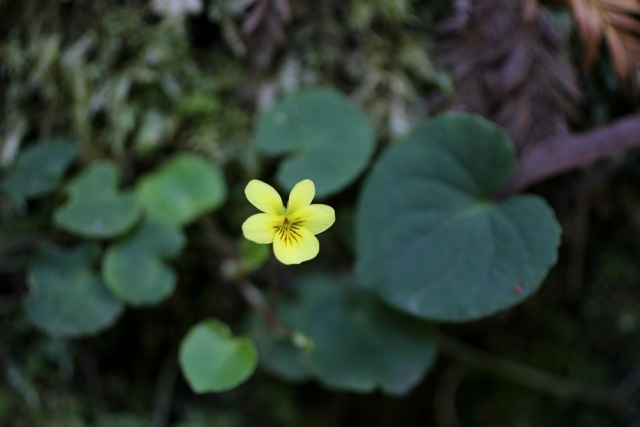 There are a couple of other species of yellow violets in the Bay Area so be sure to check a key before deciding which you’re looking at. 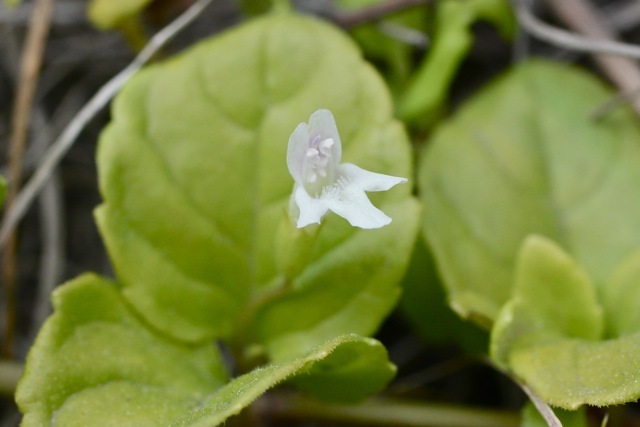 Only one other species has heart-shaped (cordate) leaves, but it can easily be distinguished from redwood violet because the stems are upright (not creeping) and the leaves are located on the stem, right below the flower. Three green leaves surround three white petals surround a cream-colored, three-parted pistil–each part offset from the other to form a lovely pattern. The whole thing sits perched atop a slim stalk like an elaborate parasol. This large, striking flower is Pacific trillium (Trillium ovatum, also known as wake robin). Ankle-high groves of it are in bloom along the steep ravine trail on Mt. Tamalpais; a stunning sight beneath the towering redwoods: beauty above and beauty below. 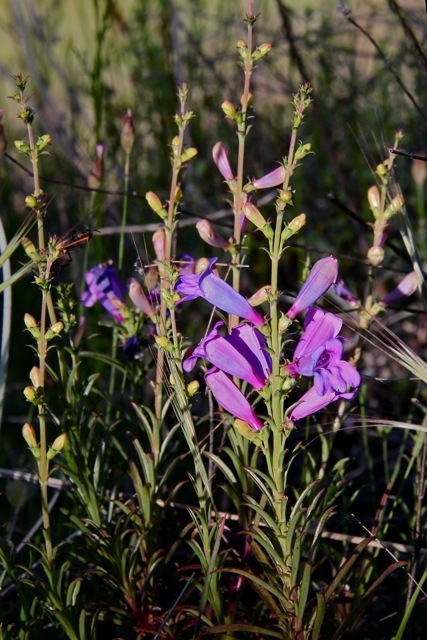 This low-growing perennial thrives on shady hillsides and other places that stay moist but are well drained. Trillium is a member of the Melanthiaceae (the false hellebore family, which is a close relative of the lily family) and like lilies it has all of its parts in sets of three, including six yellow stamens. The white flowers turn purple as they age. Each year a fresh stalk sprouts from an underground rhizome. The plant was used medicinally by various Native American tribes, but only externally–as far as I can tell. An infusion made from the roots was used as a wash for sore eyes, and to treat boils. The Skagit considered it poisonous. Trillium has also been used as a love potion–the Makah tribe would apply a poultice made of pounded roots as a love medicine; unfortunately my reference doesn’t say what the desired result is, or where the poultice is applied.